Nicolas Cage stars in Knowing as John Koestler, a professor of astrophysics at MIT who struggles to decipher the meaning of seemingly random numeric scribblings on a 50-year-old piece of paper that his son, Caleb (Chandler Canterbury), receives at school. A young schoolgirl, Lucinda (Lara Robinson), had scribbled those numbers on the paper 50 years ago. Throughout his quest to find answers, John seeks help from Diana (Rose Byrne), Lucinda's daughter. 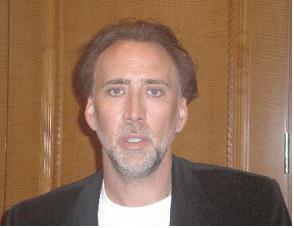 Nicolas Cage has previous starred in many films such as Next, National Treasure, Ghost Rider, The Weather Man, Bring Out the Dead, Face/Off, Red Rock West, Vampire's Kiss, Wild at Heart and Leaving Las Vegas, for which he won an Oscar for Best Actor in a Leading Role. He also directed the film Sonny. It was a real pleasure and privilege to interview him. 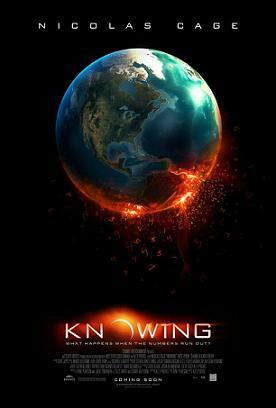 Summit Entertainment releases Knowing nationwide on March 20th, 2009. NYC MOVIE GURU: Where does your energy and passion for acting come from? NC: It changed. In the beginning it came from an almost punk rock need to express a lot of anger wherever that may have come from. As I got older it became or is coming more from a place of wanting to use the craft to help others in some way, to hold a mirror up to the situations that we're going through, to actually be more cautious about the way that I use the power of film and to see if there's anything that I can do in the performances that will resonate in the public a similar string that's on people's minds and is on my mind. That way we have that relationship. NYC MOVIE GURU: How has acting in films changed your life? NC: Just the other day I was invited to go down to the subway rails and to be two foot from a whooshing subway train because I had to pass getting a certificate for subway rail safety. I never would've been in that situation before if I wasn't making movies. It was dangerous, but at the same time it was fascinating and got me thinking about the third rail, the awesome third rail. One of the great bonuses of being a film actor is that I get to go to different places, meet inspiring people and learn different things. So all those details add up, but again with Knowing, I'd already kind of sorted through whatever philosophies I wanted or needed to come to terms with before the movie came to me. NYC MOVIE GURU: Which one of your earlier roles still resonates for you on a second viewing? NC: I don't really watch my movies again, but I can speak by the echo of it. I would say that Wild at Heart and Vampire's Kiss had more of that kind of energy to it. That's not to say that I can't still get kind of punk rock or angry, but I just think that I'm doing it for different reasons now. NYC MOVIE GURU: What kind of research did you do for your role as John in Knowing? NC: I grew up with a professor so that was all the research that I really needed. I just used my own recall of what that experience was like. NYC MOVIE GURU: Have your children ever expressed an interest in acting and how would you feel about that? NC: My oldest son, [Weston], right now [is] very immersed in his music, but there might be a time when he chooses to go into the cinema. My youngest son is three and a half [years-old]. NYC MOVIE GURU: How did your relationship with your own son inform your relationship to your son in the film? NC: Well, I dedicate the movie to my first son,[Weston], because that's what the relationship was really. It was me and him. I just have memories and this script came to me at the right time. I had the life experiences and the emotional resources to play John Koestler and indeed some of the lines in the scenes came from direct memories of my times with Weston. I had been looking for a way to express those feelings for a long time and having been a single father out in California, I know that there is a gender bias depending on which lawyer or which psychologist or family therapist that you talk to. It's like there's a full moon out if a father wants to see his son. That's just not true. Just because you're a man doesn't mean that you can't raise your kid. I think that families should stay together, but if you are a single father don't give up no matter what they say. So, I wanted to have a chance to express that, to show that archetype in a movie, that you can have a devoted, positive relationship between that family, a father and a son as well. NYC MOVIE GURU: What kind of discussions did you have with director Alex Proyas about your role and performance? NC: We both agreed that the character should be almost cinema vérité, that there should be almost a documentary style to the performances so that it would make the experience more terrifying for you and perhaps more visceral in some way. NYC MOVIE GURU: What distinguishes Alexs from other directors whom you have worked with? NC: Well, he has this enormous capacity to design shots and design F/X in a way where you know it's him that's doing it. They look beautiful. They're also scary and they have his signature. So I don't really know where to begin other than that he's like a painter from any era of painting. He has the same abilities. That's what I mean about him in that I think he's an original voice. I don't feel like he's ever copying anyone else. NYC MOVIE GURU: Did Alex allow for any kind of improvisation or input about your character? NC: I generally do enjoy the rehearsal process because that's where you can share your ideas, get your thoughts and feelings out and see whether or not they're going to land, whether or not people are going to agree with them, particularly the director. So you can sort out in that process any elements that need to be sorted out before you're on the set and of course that saves time and it also makes everyone more comfortable working together. Alex is the sort of director that's open to suggestions and makes you feel comfortable, relaxed enough to be able to create. It's quite liberating and he was open to various ideas. NYC MOVIE GURU: What was it like working with actress Rose Byrne, who plays Diana? NC: It was refreshing to have a movie without it having to resort to love triangles or broken hearts and to have an extremely talented actress play something other than those notes because it's only fair that actresses get the same shots at playing complex characters as actors do. Rose is very serious about the work. She's a real craftsman in that that accent is flawless. I couldn't believe that she was Australian. She has a very pronounced Australian accent though and so that in itself shows you the level of technique and also the willingness for her to go to places with me that were perhaps more surprising again. She didn't quite know where I would go but I felt that was important to get that spontaneity and she went along with it. So she's got a lot of guts and a lot of depth. That also goes for Chandler Canterbury. Both of those actors, the movie wouldn't work without them because they were phenomenally real. Chandler has this enormous depth for his years and he's so truthful. It seems effortless. Often you hear stories about never working with children. I disagree because children still have that residual magical thinking. They haven't had their imagination knocked out of them by turning into adults and life experiences. That's what acting really is in my opinion. It's the ability to imagine what's going on around you is real. So, it makes it very easy and it's a joy for me to work with Chandler. NYC MOVIE GURU: What was it like trying to get into character during the scene when John introduces himself to Diana? NC: It was kind of awkward at first because I was trying to go around the scene in different ways that would terrify her and yet at the same time I had to keep her with me. Now the thing is that Diana's mother had this calling and this ability and she was living with the curse, if you will, of feeling that she was going to die on that particular date. So when I was able to give her those numbers that's what brought her back, but I didn't really see how there was any way that I could get around it. I felt that at some point early on in that dynamic that she was going to be scared of John and not to shy away from that, not to sugarcoat it any way. NYC MOVIE GURU: What kind of role do you think Hollywood is playing during these strenuous economic times? NC: Well, more than ever movies reveal themselves as healing, as helpful, as encouraging, as escapist, anything that makes someone get through their day in these times. It's the best form of entertainment and it's still arguably the most inexpensive form of entertainment. I always say to myself that if I can make a movie that makes a kid smile or gives them some hope or gives them something to get excited about then I'm applying myself in the best way that I can. I don't think that just goes for kids. I think that it goes for adults as well and for families. So, there is a need to go to the movies and just shut your mind off from the problems that are happening in our daily lives, the stresses between countries, the economy and global warming – all of those things that are on our minds. But at the same time I think that movies can help guide us through those experiences because I think all art tries to grapple with, redefine, come to terms with, express what's happening now when it's working. You can be entertained but you can also be stimulated to think about things. Knowing is one of those movies where you're going to get the spectacle and you're going to have the entertainment in the grand science fiction tradition, but also it will perhaps stimulate some discussion to help you sort out on your own where you might chose to go in terms of your own needs. NYC MOVIE GURU: Is there any particular genre of film that stretches your acting muscles more than another and is there a genre you'd like to do that you haven't done? NYC MOVIE GURU: What appeals to you about the science fiction genre? NC: Well, good science fiction is intelligent. It asks big questions that are on people's minds. It's not impossible. It has some sort of root in the abstract. So automatically you're getting closer to potentially divine sources of interest because it is abstract. It's one of the only ways that a film actor can express himself in the abstract and have audiences still go along for the ride. They don't contend it. They accept it, that they're going to go places that are a bit more of the imagination, a bit more out there and that's more and more where I like to dance. The other thing is that I got a little tired of movies where I had to shoot people and I got to thinking about the power of film and what that power is. The power is in fact that it really can change people's minds. I had that experience with 'China Syndrome'. It made me aware. So I thought if it was this powerful, the power to change people's minds then perhaps I should just be a little more responsible with that power. That's not to say that I don't believe in freedom of speech. I do. It's just that, at this point in my life, I would rather entertain you with the spectacle and with the imagination as opposed to servicing your blood-lust appetites. But that's not to say that I might not find myself in that situation again. There are ways of doing it, even by showing it where it can be ironic and there can be awareness in that as well. Just not gratuitous in the sense that I want you to get off by watching someone's head explode. NYC MOVIE GURU: How do you think you would handle the gift of knowing the future? NC: I think that for me I would want to know when it came to my children, if there was a way that I could prevent something. I don't think there's anything that would take over my parental survival instincts, but other than that I like surprises. I think that if we knew everything that was going to happen it would be very, very boring. NYC MOVIE GURU: Have you ever had a sense of knowing, an inclination, that came true? NC: Yes, I think we all have. I think it's a part of being human having those experiences, call it what you want, déjà vu or whatever. You can explain it away with science or you can explain it with something perhaps more paranormal, but I think they're still talking about the same thing. If you tell me there's no such thing as a sea monster I'll show you a white shark. It's all semantics in my opinion. NYC MOVIE GURU: How much of the action sequence with the airplane was real and how much was CGI? NC: That particular sequence with the exception of the plane itself was all real. It was one shot and we rehearsed it all day long. That made it both easier for me to do the scene and also really difficult because it was easy in that those were real people and I was genuinely scared for them. So I didn't have to act that. You are actually seeing a guy who's terrified because those are people who are on fire. They're stunt people, but they're still people and I took it personally that none of them get hurt. So I had to really rehearse it all day and get to the end of the shot without any mistakes because I didn't want to go back to the beginning again and have them light those people on fire again. I don't care if they get paid again. I was worried about them. That was the difficult part of it, making sure that no one got hurt. Now the subway scene was different. That was more imagination. NYC MOVIE GURU: Do you have any aspirations to direct again in the future? NC: I wanted to direct again. I haven't had time, but I would like to. When you direct you have to really devote a year of your life that project and so it's not something that I can really do right now, but I will again at some point.